Tomorrow, Friday, All Saints Indian Mission, 3044 Longfellow Ave. S. in Minneapolis, is hosting a Fry Bread Taco and Beadwork Sale to support the work at the Standing Rock Reservation to stop the Dakota Access Pipeline. It will run from 10 a.m. to 8 p.m. or until supplies run out. According to a website, its mission is: “Bringing communities together to support the protection of clean water for generations present and future. To better the environment one step at a time by standing together.” Click on the link for more details. The Baltimore Yearly Meeting of the Religious Society of Friends (Quakers) approved a statement supporting the Standing Rock Reservation’s opposition to the Dakota Access Pipeline. (Baltimore’s Annual Meeting is a regional association of 54 Quaker Meetings with more than 7,000 Quakers in Virginia, Maryland, the District of Columbia, West Virginia, and Pennsylvania. The Baltimore Yearly Meeting supports the sovereign government and people of the Standing Rock Sioux Tribe as they wage a nonviolent, legal battle against those who would endanger their heritage and their future natural resources. The wise leaders and their supporters are strong in spirit and wisdom, in patience and in vision. The Lakota and Dakota people, with their allies, have inspired unity among Native nations and others in their quest to save their lands and people from harm. They are waging this moral and legal struggle not for themselves, but for future generations. Pastor Joann Conroy (Oglala) is the President of the ELCA American Indian/Alaska Native Lutheran Association and a friend of Healing Minnesota Stories. Here is what she posted on the organization’s Facebook page Oct. 12 — Indigenous Peoples Day — on the Dakota Access Pipeline standoff. As I read and watch the unjust treatment of our people at Standing Rock Sacred Stone Camp in ND; crimes against our black brothers and sisters and against other people of ethnic descent, I can hardly hold back tears and the sadness of my heart. A Call for Artists for Standing Rock! 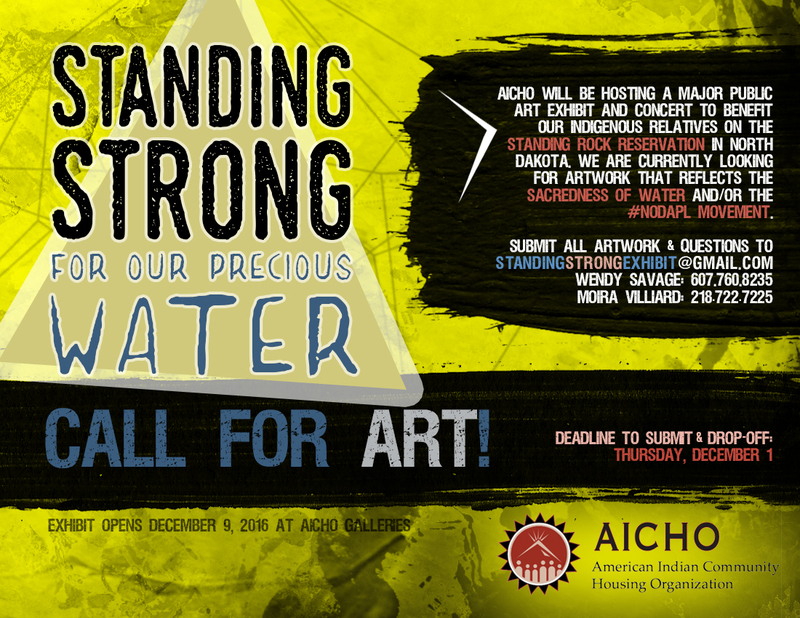 The American Indian Community Housing Organization (AICHO) in Duluth will be hosting an art exhibition / concert / community feast / benefit titled Standing Strong for Our Precious Water on Friday, December 9, 2016. More details to come. Right now, they are looking for visual artists to submit work in any medium for display. They encourage artists interested in selling their pieces to contribute a portion of their profit to the Standing Rock cause. Submit works of art to standingrockexhibit@gmail.com – from there, you will be notified if your work has been selected. Artwork must relate back to the #NoDAPL Movement, Standing Rock, or the sacredness of water. You will have until December 1, 2016 to drop-off your work. Questions? Email standingrockexhibit@gmail.com or contact Wendy (607-760-8235) or Moira (call only, 218-722-7225). A free panel discussion to learn diverse Native perspectives on the Dakota Access Pipeline will be held Monday, October 31, 3 p.m. in the Crosby Seminar Room, 240 Northrop at the University of Minnesota. It is being hosted by the Institute for Advanced Study. Click here for details.